Quick! Someone pass Troye some paracetamol! After an incredibly positive and exciting week for Troye Sivan's career, it seems to all be coming to a very disappointing halt for his fans. 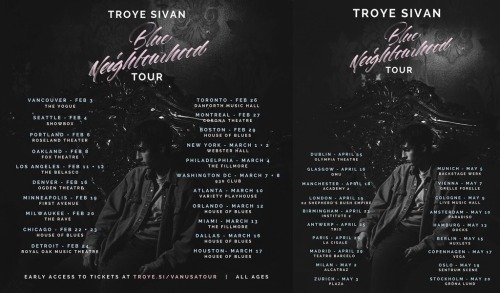 The Australian singer informed everybody on Tumblr that he would have to postpone two of his Canadian 'Blue Neighbourhood' tour dates due to his deteriorating health conditions. In what Troye calls a "cruel spell of deja vu" following cancelled tour dates in Sydney and Perth back in November 2015 due to the same illness, it seems that the Youth singer can't keep on top of his health at the moment. From his Tumblr post, it seems that Troye is suffering once again with a "bad case of sinusitis" and might even need surgery on his nose at some point later this year. The only reason he feels as though he's been able to perform through his sickness in recent days is because of the massive adrenaline rush he felt following the release of his fantastic new music video. The Canadian gigs that have been canceled are as follows: Danforth Music Hall in Toronto on the 26th of February, and the Theatre Corona Virgin Mobile in Montreal on the 27th of February. News is that Troye's management are already working on rescheduling those tour venues for a later performance and he begs that fans with tickets hold onto them tightly as they might need them again in the future. To all of his Canadian fans who were dying to seeing Troye bop around on a stage with them, he says that he's "so so so so so bummed that you guys are getting the brunt of this healing process, but unfortunately I will have to postpose". However, in true Troye/cinnamon roll fashion, he finishes up his statement with a massive sign of appreciation and thanks towards all of his fans; "I'm the luckiest kid in the world to have the support of you guys and I want to make sure that I am well enough to be present and take in and enjoy every single moment that I'm lucky enough to share with you all". If you haven't seen the music video for Troye's incredible song Youth, then here's the brand new addiction in your life. You're welcome!